Well, Well... Since it's Valentines Day and my mind isn't working properly right now (we've had a houseful of sick people all week) I almost forgot to have the party. So Sorry! Better late than never right? So, welcome to another Delightfully Inspiring Thursday Party! If you're new here and you haven't seen the monthly organization challenge that I have going on, feel free to join in. We'd love to have you! If you're following along with the challenge, PLEASE NOTE ~ this is NOT the February Challenge Link Party ~ Wait until the end of February to link your paper organizing posts. This is my weekly inspiring Thursday party. Here are some things you should know BEFORE linking up. Please follow these rules, I do care what goes on my site and I will delete those links that don't abide by my rules. Link posts pertaining to: organizing, decorating, crafting, party planning, gift ideas or recipes. Do NOT link: Etsy shops, selling sites, free printables or giveaways. 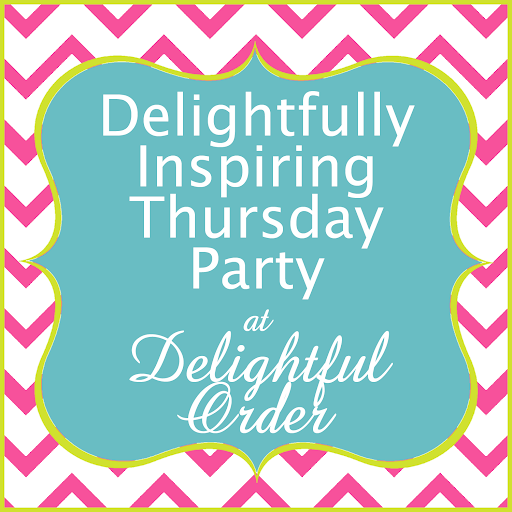 Post the Delightfully Inspiring Thursday button under your post or somewhere on your blog so that others can find the party and join in. Please link directly to your post, NOT your blog. Visit others who have linked up and leave them a comment. We all LOVE comments. Follow me, if you don't already, so you'll remember to come back next week. Not sure how to link up? It's easy. Go HERE for a complete tutorial. By linking to my party, you give me permission to feature your post, right here on the blog. Thanks so much for hosting! I hope you and your family feel better really soon and that you have a Happy Valentine's Day! Hope your family recovers quickly. This is my first time to link up! Thank you for hosting. ! Thank you so much for hosting, Happy Valentine's Day!! Thanks for hosting. I understand about sick people. We've been there too. Hope everyone is feeling better soon. Happy Valentine's Day! Thanks for hosting. Happy Valentine's Day! Thank you for hosting! Hope you had a great Valentine's Day! Thanks for hosting!! Have a terrific weekend!! I am happy to inspire and share my ideas and photo's with you. I simply ask that you credit DELIGHTFUL ORDER with a link back to my site. © 2010-2017 Delightful Order. Powered by Blogger.